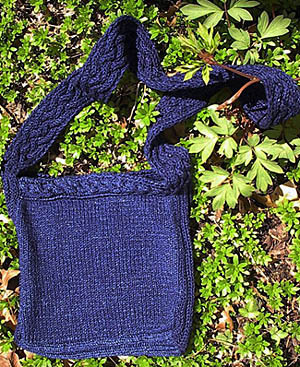 I designed this bag to wear slung across the chest, keeping your hands free. Perhaps it can carry your latest small project to the shore or to the park on a Saturday morning. Tasha could even hold your yarn while you stand and knit, waiting for the train or the weekend beach bus. 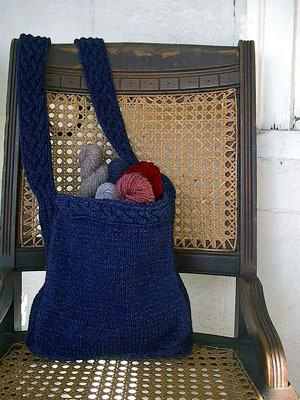 The denim yarn wears well and has a faded, comfortable look. The Loose Five-Rib Braid Cable was taken from Barbara Walker's Second Treasury of Knitting Patterns. Using #5 needles CO 16 sts. Row 1: K1, [k2, p2] 3 times, k3. Row 2: K1, [p2, k2] 3 times, p2, k1. Row 2: K1, p to last st, k1. Work 9.5 inches, ending with a RS, then BO in patt. Using smaller needles CO 12 sts. Rows 1, 3 and 5: K1, k1 tbl, p2, k4, p2, k1 tbl, k1. Rows 2, 4 and 6: K1, p1 tbl, k2, p4, k2, p1 tbl, k1. Row 7: K1, k1 tbl, p2, BC, p2, k1 tbl, k1. Note: Back Cross [BC] sl 2 sts to cn and hold in back, k2, then k2 from cn. Using larger needles CO 16 sts and k 1 row. Row 1: K3, [p2, k2] 3 times, k1. Cont as set for 9.5 inches, ending with a WS row. Row 1: K1, [k1, m1, k1, p2] 3 times, k1, m1, k2. Row 2: K1, [p3, k2] 3 times, p3, k1. Note: First and last sitches are selvedge stitches not included in following cable patt – use slip stitch method. Row 1 [WS] and all other WS rows: K2, [p2, k1] 4 times, p2, k2. Row 2: P2, [k2, p1] 4 times, k2, p2. Row 6: Rep Row 2. Row 8: P2, [BC, p1] twice, k2, p2. Front Cross [FC] sl 3 sts to cn and hold in front, k2, then sl the p st from the cn back to the left-hand needle and purl it, then k2 from cn. Back Cross [BC] sl 3 sts to cn and hold in back, k2, then sl the purl st from the cn back to the left-hand needle and purl it, then k2 from cn. Rep rows 1-8 until desired length ending with row 1 of cable patt. Dec for Side 2: K1[ k2tog, k1, p2] 3 times, k2tog, k2. Cont in rib as for first side for 9.5 inches. Cast off in patt. Note: After washing all lengthwise measurements of 9.5" will shrink to 9"
Machine wash and dry all pieces as per ball band instructions until desired fading and size is achieved. When done, pieces should match together. Sew top cable edgings to front and back. Sew bottom to front and back. Join sides to front and back. She is a mother of two and keeps a weblog where she talks about knitting and sometimes spinning. Pattern & images © 2003 Leigh Spencer. Contact Leigh.